SEE the War of the Chariots! SEE the Contest of Giants! SEE the Combat of Kings! SEE the Arena of Tigers! SEE the Court of Lovers! 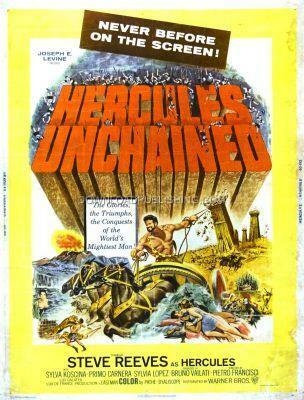 Hercules (Steve Reeves), returns to his native land of Atica, part of ancient Greece. He returns with his new wife, Iole (Sylva Koscina), daughter of King Laerte and her brother Ulisse (Gabriele Antonini). They are travaling to Hercules home, the City of Thebes. They camp for the night and take shelter in a Cave where they find king Headabus of Thebes. He has exciled himself there after renownsing the Throne, giving in to his two sons, and letting them rule over Thebes, each to rule for one year, then seeding the throne to the other. Now one year has passed but the first brother refuses to seed the throne to the other. King Headabus sends Hercules to Thebes to stop the Civil War and to convince the Ruler to let his brother rule as per their pac. On his Way to Thebes, Hercules drinks from the fountain of forgetfullness and forgets everything and is seduced by Queen Onfale, of Lidia. Ulisses must make Hercules remember so he can complete his mission.